Justin Bieber is back in metro Atlanta. Local residents spotted him at the Marietta Ice Center in east Cobb County Tuesday night (Feb4) and posted some photos of their chance encounter. There were only about 40 people there. Two limos pulled up and Justin walked right out with his entourage. He skated a while and then said hey to a few of my friends. He was there for about an hour. Initially he was allowing people to take pictures of him but then he was like nah, and then got really annoyed at everyone and left. 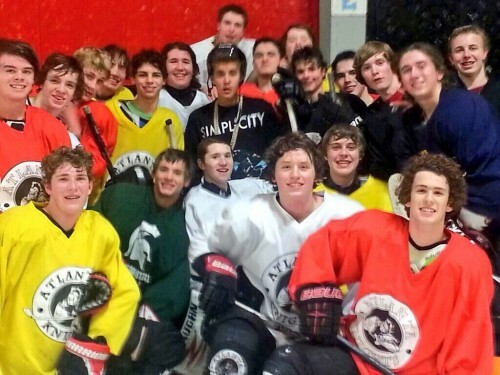 lol look at the group photo, it’s kinda weird just randomly having Justin in the pic 😛 , i mean he’s JUSTIN . What an idiot. Skates around in those chains and weird pants. No wonder he couldn’t take a simple pass. I would of checked him into the boards! Omg .. Justin .. your so adorable . I love you so much. God bless you ..
Awww that is sweet. Have fun with the guys Justin. Luv you.